Quantity of one is the ultimate leverage when you're producing something. The whole purpose of any business — whether it's a restaurant or a manufacturing company or a distribution company — is to be able to service one order at a time. The purpose of this site is to explore my friend Adam Post’s “Quantity of One” concept. Quantity of one is the ultimate leverage when you’re producing something. The whole purpose of any business — whether it’s a restaurant or a manufacturing company or a distribution company — is to be able to service one order at a time. In Think and Grow Rich, Napoleon Hill talked about how a family in New York City could inexpensively eat a breakfast that included a diverse selection of foods sourced from all over the world including bananas from South America. How was this possible? In the early 1900’s it was magical that so much capital could be accumulated and wielded so as to be able to profitably and effectively deliver one banana to a breakfast table. The estimated cost at the breakfast table for bananas was $0.02½ — a tremendous example of being able to serve one customer one banana which was grown on a different continent. Then, in Star Trek, the idea of a food replicator was introduced. The replicator made it possible to get one banana without the need for steam ships, trains, and all kinds of specialized labor. That was its own kind of magic. Instead of creating an inventory, the replicator simply created the end product. Of course, that was science fiction. Now, technology has finally started to catch up with Star Trek and it is possible to truly manufacture products in a quantity of one — products which used to require large production runs in order to be cost-effective. Instead of capital being used to generate and move inventory, capital is now being used to create systems that can produce finished products for the customer in a quantity of one. This is a revolution in business. It is no longer necessary to have “hundreds of millions of dollars, not to mention the armies of trained employees required to man the ships and trains” in order to deliver a finished product. And now there are also services/systems springing up offering the manufacturing system that make it so that there are very few intermediaries between the creator and the customer. These services allow individual creators to reap the benefits of someone else’s capital and system. Examples of manufacturing with QTYONE: Being able to profitably produce one item at a time allows a producer to satisfy each customer as the customers come along — making all kinds of ideas become feasible and making Quantity of One the ultimate leverage. There is no need to have a huge inventory of finished product in order to serve a customer. In some cases, the end product can even be customized to add additional value — whether is it a special wrench or a children’s book customized with the name of the child. To get started, listen to this interview with Adam Post in which he explains in general terms his “Quantity of One” concept. Please sign up to the QTYONE newsletter and I will keep you updated as I explore the QTYONE concept out in the world at large and how it changes my own personal projects. 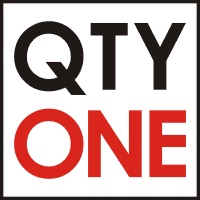 Subscribe to the QTYONE email newsletter. T-shirts produced profitably in a Quantity of One! 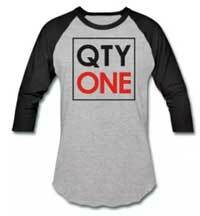 Get your very own QTYONE T-shirt and help support QTYONE.com so I can keep writing new articles on the site.